All transactions are safe and secure with a reliable history in online purchasing behind each of our associates. 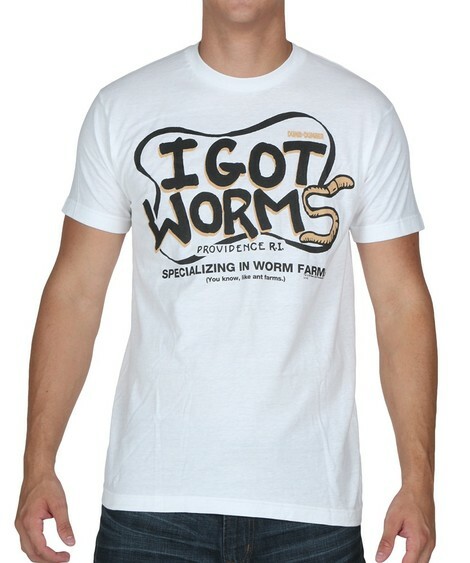 Buy the I Got Worms t-shirt to own Dumb and Dumber clothing and merchandise. If you are an entrepreneur like Harry, then perhaps you should consider starting a worm farm of your own. You can even ask your best friend Lloyd to help you. This Dumb and Dumber I Got Worms t-shirt displays the funny name of Harry's worm business. If you really want to be Harry and Lloyed then the Dumb and Dumber costumes, including the Lloyd Christmas costume tuxedo, are perfect. Wear one on Halloween or to your next formal occassion. In addition to the I Got Worms tee above, browse the Dumb and Dumber Clothing Gallery for more apparel like men's and women's clothes, kids shirts or hoodies.